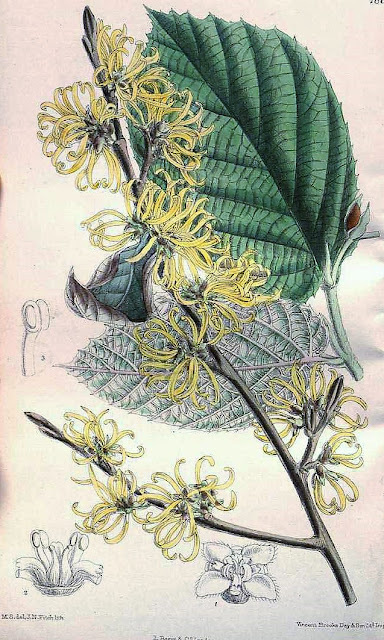 Commonly known as the chinese witch hazel, Hamamelis mollis is a ornamental, deciduous flowering plant noted for its unusual winter blooms. Native to central and eastern China, it was first introduced to western science in 1879 by English botanist and plant collector Charles Maries (1851 - 1902), and then much later by the notable plant hunter Ernest Henry 'Chinese' Wilson (1876 – 1930). Arguably the most handsome of all species and cultivars, and certainly the most popular, Hamamelis mollis is a large shrub which under favourable conditions can be expected to grow to approximately 8 metres tall! However in the United Kingdom you are more likely to see mature specimens between 2.5-4 metres in height. The mid-dark green leaves are large ( 8–15 cm long and 6–10 cm wide), ovoid and softly hairy. They also provide some reasonable autumn colour turing a pleasing butter-yellow colour before falling. From December onwards and usually after leaf drop clusters of fragrant, ribbon-shaped blooms appear. The petals are 15 mm long and borne in groups of four from a red-tinged base. Once pollinated, hard woody seed capsules are formed, each containing 2 shiny black seeds. These seed pods are approximately 12 mm long, and once mature will split explosively ejecting the seeds some distance away from the parent plant. 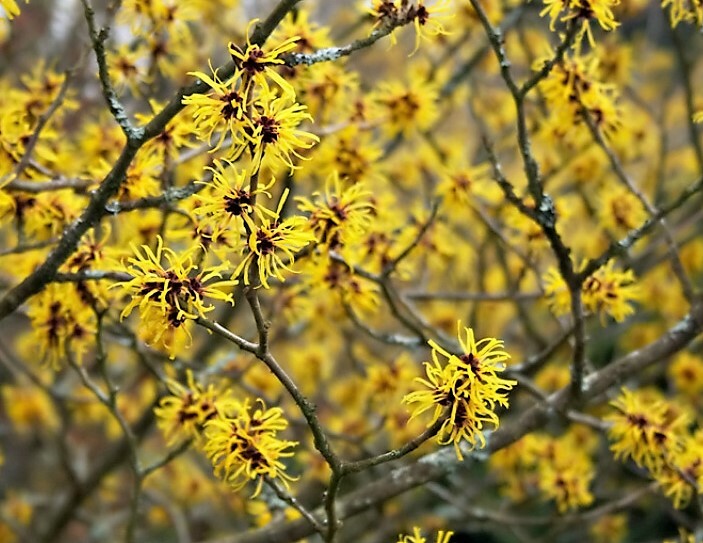 As with many Chinese origin plants, Hamamelis mollis is easy to grow in the United Kingdom. Position in an open but unexposed site. For best flowering plant in full sun although this species will quite happily grow in semi-shade. It will perform best in moist, acidic, well-drained, humus-rich soils. So long as these conditions are met they will even do well on chalk! Be aware that leaf-scorch can occur during periods of summer drought. For grafted examples, keep an eye on root suckers emerging at the base of the trunk and remove them by tearing them away from the base as soon as they are large enough to grip.